At present, we are feeling rather swamped in our crop of home grown Dutch Cream potatoes. So far it is not even a particularly prolific crop (there are still four plants in the ground about which I’m feeling very nervous) but it has produced more potatoes than we can reasonably eat and we are not in possession of a root cellar. If we were, it would be a wine cellar. 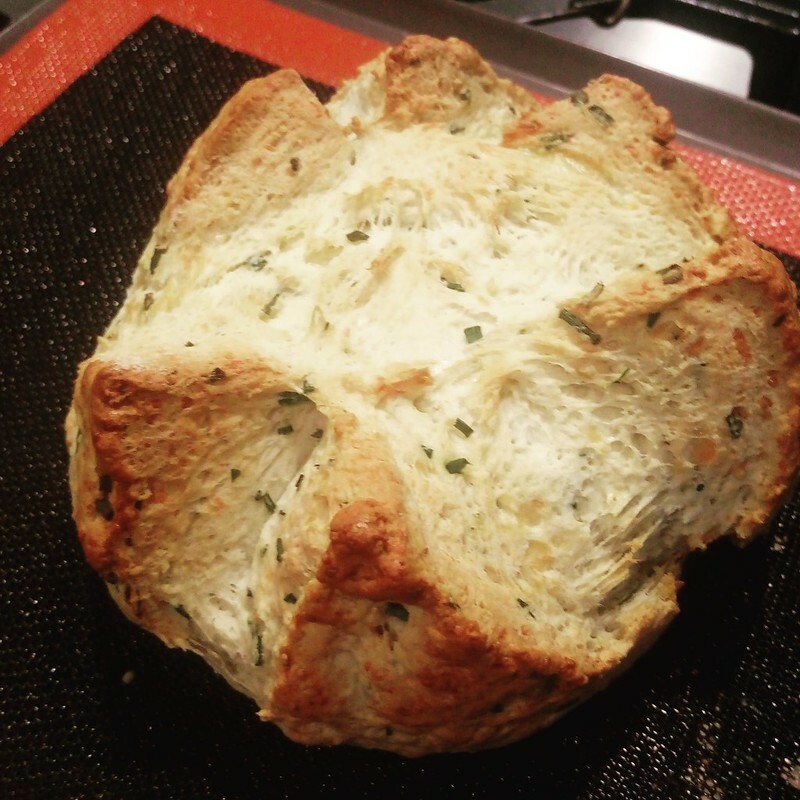 Fortunately, I’ve made potato bread before and I thought it would be an opportunity to kill a couple of birds with one stone. The toddler refuses to eat both potatoes and bread (the exceptions being chips in a pub and one type of milk roll that my mum makes). I originally thought that growing and digging up potatoes might enthuse him but it turns out that it has only enthused him in shouting about the “tatoes in the garden” and ferreting about in the soil. Making the bread dough (using a recipe from The Big Book of Bread ) with him was surprisingly difficult. He was excellent at ricing the potatoes but four hands in a mixing bowl (yep, we did this all by hand … the KitchenAid got a break!) made for a lot of flour on the bench and made it very difficult for me to judge how much water we needed to add. And a toddler can shove a surprising amount of part made bread dough in his mouth when you’re not looking. Apparently raw flour, raw dough and everything in between are ripe for ‘tasting’. 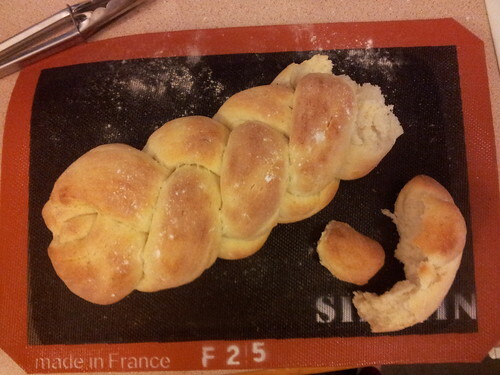 It’s surprising then that doing the four plait with his help was actually really easy. While Peppa Pig is inculcating my child with all manner of feminist socialist politics, she’s also taught him all about creating ‘wiggly worms’ so I was able to give him chunks of dough and let him loose. So – the four plait. We were originally going to make rolls, as I figured that small hands might be able to work with simple knots. However, I decided that I also need to stretch myself just a bit. I enjoyed watching almost all of Masterchef Professionals (UK), including the bread skills test where Monica Galetti set four chefs the task of, amongst others, doing a four plait. I’ve never done this before but having had long hair almost my entire life I am totally adept at a three plait (in hair, but not shabby when it comes to bread either). So when I say that I found this easy to do – you’ve got your caveat. I had a look around the internet for written (rather than video) instructions because the thing with plaiting is that you need to know which strand to put where. The instructions at Alchemy in the Kitchen were exactly what I needed. Mix the flour and potato together in a large bowl. Use your hands and incorporate so that the mix is crumbly. Add the yeast, salt, cheese, seeds and pepper and mix well. Slowly add the warm water. You may need more or less than the 200mL depending on your flour, so add about half and incorporate well before adding a little more as you need it. You need to bring all the ingredients together in a soft dough. Tip the dough out onto a lightly floured bench and give it a good keading, until the dough is soft and silky. Lightly grease the dough and return to its bowl. Cover the bowl and leave to rise until roughly doubled in size. 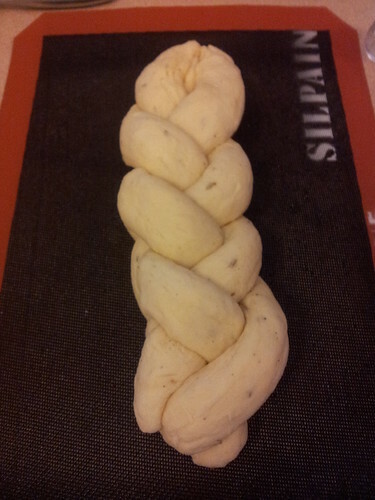 Lightly knead again and, if doing a four plait, divide the dough into four equal portions and form these into ropes that are slightly tapered at both ends. Plait using the 4 over 2, 1 over 3, 2 over 3 approach. Do the plait on a slightly floured baking tray (or use a siplain (silicone) mat, which you can move onto a baking tray easily later). If not plaiting, shape into whatever shape you want. Or even make rolls. Cover and leave to roughly double again. Preheat oven to 180C fan (200C conventional) and cook for approximately half an hour. Bread should be risen, tanned in colour and should sound hollow when tapped on the base. If making rolls, you'll probably need about 15-20 minutes in the oven. Leave to cool on a wire rack and gobble down with lashings of butter! 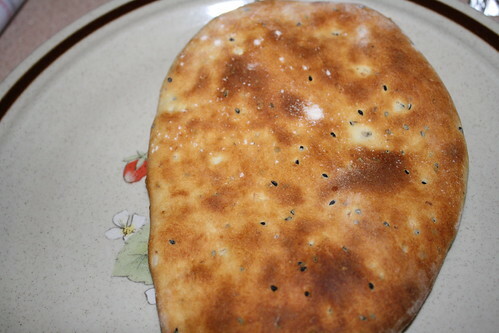 This is my go-to naan bread recipe that I use whenever I need a flatbread. It doesn’t have to go with a curry and they’re quick enough to put together for any mid-week meal. This recipe comes from The Big Book of Bread which I won a few years ago through the excellent Baking Mad website. This is an English site run by the Allinson flour people but it’s a great resource and worth checking out wherever you are. Take 300g of strong white flour and add 1½ tsp of dried yeast and 1 tsp of salt. If making this by hand, make a well in the centre and add the wet ingredients. If you’re using a stand mixer, you can get away with just dumping everything in the bowl! Add 4 tbsp of natural yoghurt, 1 tbsp of neutral vegetable oil (the recipe specifies sunflower but we rarely have this at home so I often use peanut oil – you just don’t want anything with a strong flavour so leave your best extra virgin olive oil in the cupboard …). Mix this together and blend in 125mL of warm milk to make a soft dough. I usually add a 1 tsp of nigella (kalonji) seeds to the mix too. Or you can sprinkle them over the naan before baking. Or you can add a clove of crushed garlic, a teaspoon of ground coriander … you get the idea. When the dough has come together and been kneaded (by either you or the machine) leave the dough for an hour or so to rise. Preheat your oven and your baking trays to HOT (I usually go for 220°C fan, the recipe specifies 230°C convection). Make sure you preheat the baking trays – it helps the naan cook more quickly and prevents them from sticking. Punch down the risen dough, knead it and divide it in to four. Roll out and stretch each quarter into a tear drop shape. The recipe specifies leaving the naan, covered, for 15 minutes. I rarely do that because by the time I finish rolling them out and getting them on trays I figure that’s rest enough. If you’re organised enough, brush the naan with melted butter or ghee before baking. Baking for 10 minutes – the naan will be puffed up and golden. Wrap them in a clean tea towel and serve. The naan will keep til the next day but they are better eaten straight away. They are just such an improvement on the shop bought ones that you’ll never go back!